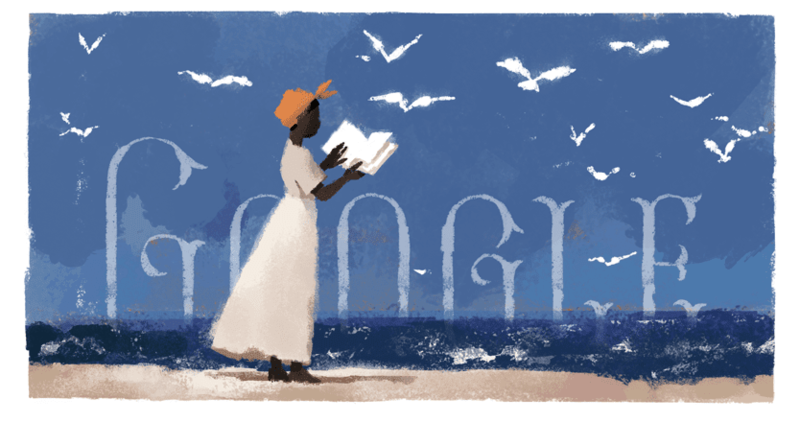 On October 1, 2018, Google celebrated the 230th birthday of Bermuda-born slave Mary Prince with this illustration. Born in 1788 in Brackish Pond, Bermuda, Prince was sold several times during her life. She ended up on the island of Antigua in 1815 where she joined the Moravian church and at the age of 29 learned to read. Although she married, she and her husband were shortly separated thereafter because Prince’s family moved to England taking her with them. This act turned out to be fortuitous from Prince because following the passage of the Slave Trade Act in 1807, slavery was no longer allowed in England, although the institution of slavery continued in the British colonies. Prince was legally free on British soil, but she had no means to support herself. Under the prevailing rules of the time, if she tried to return home to her husband, she would risk being enslaved again. In 1829 Prince became the first woman to present a petition to the English Parliament, arguing for her human right to freedom. That same year some of her associates in the anti-slavery abolitionist movement introduced a bill proposing that any West Indian slave brought to England by his or her owners must be freed. While the legislation did not pass, momentum began to shift in favour of the abolitionists' cause. Two years later Prince published her autobiography, making her the first black woman to publish a slave narrative in England. Her book played a decisive role in turning British public opinion against the centuries-old institution of human enslavement. Published in 1831, the book caused a sensation, going through three printings in the first year alone. In one of the book’s many heartbreaking passages, Prince recalled being sold “like sheep or cattle” on the same day as her younger sisters Hannah and Dina were sold to different masters. On August 1, 1838, some 800,000 slaves living in British colonies throughout the Caribbean were finally set free following the passage of Great Britain’s Slavery Abolition Act, which was passed by Parliament two years after the publication of Prince’s book. Not much is known of what happened to Prince in her later years; she may have stayed in England or returned home to the Caribbean. Despite not having received a formal education, Prince is recognised as a National Hero of Bermuda for her work to abolish slavery. She has been commemorated with a statute and recently a national holiday has been proposed to celebrate her life and achievements.